The CCM RibCor Trigger 3D PMT ice hockey stick combines all of CCM’s best technological features with a host of updates that will make the elite-level hockey player drool on his skates. The redesigned Pop Matrix and X-Flow technologies, combined with the top-grade carbon fiber, make the RibCore Trigger 3D PMT stick one of the finest, best performing sticks available. Constructed with the help of elite women’s hockey players and a selection of top-performing youth players, the RibCor Trigger 3D stick comes in new shaft dimensions, featuring rounded corners and concave sidewalls for better control and a more comfortable feel in the hands. The RibCor Trigger 3D PMT hockey stick is designed with a low kick-point for an extremely short loading period and quicker shots, great for shooters looking to maximize their release speeds below the circles. CCM’s Pop Matrix technology helps the RibCor Trigger 3D achieve its faster shot release. Re-engineered RibCor geometry delivers an energy transfer that’s more seamless and efficient than in the Trigger 2, maximizing bending as well as the speed of release. The RibCor Trigger 3D PMT also features CCM’s new X-Flow technology. This advanced molding technology improves quality and consistency in the shaft by removing excess resin and voids. Combined with CCM’s Sigmatex carbon fiber, X-Flow promises skaters improved durability as well as a reduction in weight, leading to a better balanced feel. The lower shaft of the RibCor Trigger 3D PMT features a softer taper, which helps create an optimal vertical flex. The flex profile is also enhanced with an optimized flex zone in the upper shaft, resulting in an easy load and quick release. The RibCor Trigger 3D PMT includes CCM’s Ascent Blade 3 technology. This extremely lightweight blade has a tactile surface for an enhanced puck feel. The blade also features a reinforced toe and heel for added durability. The CCM RibCor Trigger 3D PMT ice hockey stick is sure to appeal to elite-level players accustomed to hitting the ice with the newest and best stick available. And the RibCor Trigger 3D PMT is likely to give the quick-shot artist exactly the sort of pro-styled performance they demand of a low-kick stick. Length: 62 Inches Length of the product measured in inches. Construction Material: Sigmatex Type of material the product is made of. Shaft Design: X-Flow Shape of the shaft edge. Blade Construction: Ascent Blade 3 Type of material the blade is made of. The Bauer Eichel pattern is the P28, CCM is under the same pattern number of P28. Thanks! The new P88 would be the most similar. Thanks! What curve is equivalent to a Bauer PM9 for CCM? 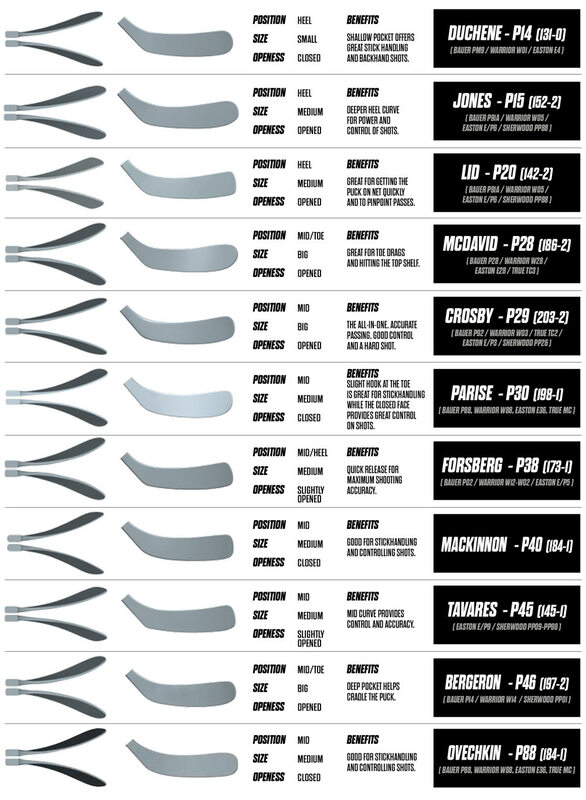 What ccm curve is the equivalent to the P88 bauer curve? The new CCM P88 Ovechkin is going to be your curve!